Jess Racklyeft is a freelance illustrator who works from her home studio in North Fitzroy, Melbourne. It’s a two-story building across her courtyard garden that wears many hats. The ground floor serves as a music studio for her husband while the upper floor is Jess’s studio, a granny flat for visiting parents and in-laws and Winston the dog’s day bed. Deb Hudson welcomed me into her home for a cup of tea at her rustic kitchen table, which doubles as an art table. Her pencils, organized in tins by colour, are spread out at one end of the table. The room is flooded with natural light. Sometimes, it’s a case of too much of a good thing and Deb has to draw under a brimmed hat, tilted askew to shade the midday sun. Her border collie chases sun shadows about the room and her canary chirrups in the background. Today, her seven-year old son, home from school sick, adds to the menagerie. Deb’s bright, intricate illustrations and daily posting have attracted thirteen thousand followers on Instagram. But as she explains, it took her a while to find her groove. No, I want to do art In high school, everyone said, “Don’t do art. You’ll never make any money.” So I studied teaching. Then I travelled. I lived in Japan. I taught English at an all-girls school and at an English conversation school. When I was approaching thirty, I was living in the Solomon Islands. I was doing office work. I wasn’t using my teaching degree, and I’d never even really liked teaching. The part I liked most was organising craft activities! I’m not sure—maybe it’s because I thought I hadn’t done anything with my life—but I realized, no, I want to do art. A degree interrupted I enrolled in fine art at Queensland College of Art. I knew right away I wanted to specialize in illustration. Two years into the three-year degree, I deferred to go overseas again. I had children and, when I wanted to go back to university to finish my degree, I was told I would have to start from the beginning. I didn’t want to do that. eBay inspo What got me started again was seeing people sell their artwork on eBay. My sister said, “You could do that.” I created a series of three paintings: a bee, a butterfly, and a beetle. I called it The Three Bs. I put them up on eBay. I had tracings of the designs and a stack of blank canvasses. When a set would sell, I’d go out to my workroom and paint them. It was a lot of work: executing, packing, and shipping the paintings. But it was exciting to see my work sell. Then I had my third child and the artwork sort of petered out. A reboot, by way of adversity I have rheumatoid arthritis. There was a period where I was unwell, and I was really unfit. I couldn’t close my fist for six months. When I got better, I was so happy to be able to hold a pencil that I couldn’t stop drawing. I like drawing birds because they’re a symbol of freedom. Also, you can decorate them however you like. I used to use Gerald, my canary, as a model. Now I’m inspired by folk art. The pencil person I’ve always used coloured pencils. At university, I was called the “pencil person.” I like them because they’re clean, colourful, and easy to transport. Last Christmas, I did a series of cards in red and blue. That was good because I only had two tins of colours to pull out and pack up! Sometimes the drawing gets waxy and the white pencil won’t lay down. I spray it with fixative and that helps give it some tooth so the white will stick. People often ask what materials I use: Prismacolour (premier) pencils and plain old Kraft paper. Online tribe I first saw the 100 Day Project [#100dayproject] three years ago, and decided to try it. Now I’m addicted; I have to do a drawing every day. I also do [Lilla Rogers’s] Make Art That Sells Assignment Bootcamp, which is a five-month online program. I’ve made great friends through those online communities. I use Redbubble to sell my work on a variety of merchandise. I don’t do heaps of marketing. People don’t like it when you use Instagram for advertising. When the Redbubble site features me on their home page, I see an increase in activity. I recently created artwork for the swing tags on a friend’s clothing line. Next, I’d like to execute on the advice I was given by an agent: to design a new collection of greeting cards and refresh my website. With three kids, the challenge is finding the time. But I love it. 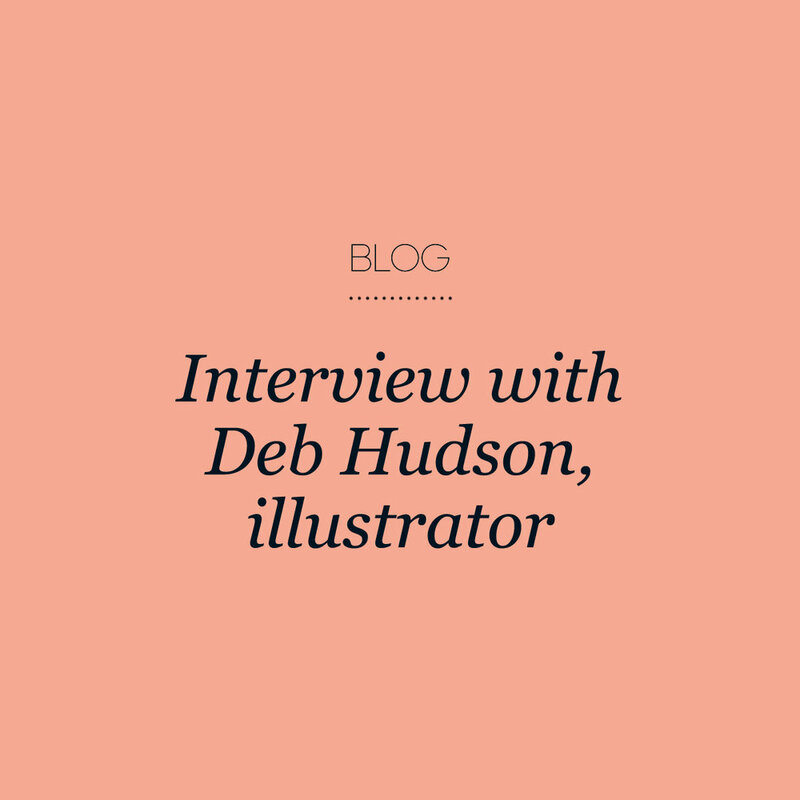 For more about Deb Hudson, visit her website or find her on Instragram (@debi_hudson). Jo Watson is a Melbourne-based screenwriter and artist. Visit her on Instagram (@diary_of_a_picture_book_maker). Dawn’s “Making Space” Dawn welcomes me into her Yarraville home in Melbourne’s inner west. We can feel it is going to be a warm day, but for the moment we are both thankful for the coolness of her kitchen and dining room. Dawn’s studio space has a gentle filtered light. The Victorian terrace she shares with her husband, Darren, is filled with art by friends and by artists she admires—such as good friend Madeline Stamer—as well as objects collected on the couple’s travels. A recent trip to the U.S. and India has prompted new designs featuring images and patterns inspired by the American desert and India’s magical colours and spices. The long wooden table in her dining room is where Dawn creates her illustrations. On the day I visit, the table is neatly arranged with resources for a work in progress. The watercolour painting she shows me is of her client’s grandparent’s home, which Dawn carefully paints with fine detail as a precious memory for her client. 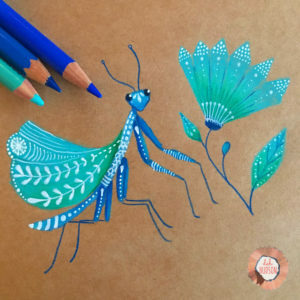 A Creative Life Along with working as a freelance illustrator and having her work published by such clients as Frankie and Hooray magazines, Dawn teaches workshops for adults in her home, and for children as a school art teacher. In high school, Dawn had great support from teachers who recognised her natural artistic ability and encouraged her to pursue an artistic career. Her friends and family have also encouraged her to keep going with her art, in part by ordering prints and custom house portraits, buying soaps, and sharing her posts on social media. “A lot of my colleagues were amazing, super troopers, cheering me on,” said Dawn. The Little Art Yurt In June 2017, Dawn will fulfill her dream of opening her very own art school: The Little Art Yurt. “I’ve always known that I wanted to teach,” she said. As Dawn awaits delivery of a large round tent, which will fill the entire outdoor space in her courtyard, she prepares for the school—planning, designing brochures, and adding students’ names to the ever-growing waitlist. She already has the most elegantly made aprons ready and waiting for the first class, hung on a plywood rack made by her father-in-law. The Hedley & Bennett aprons are examples of Dawn’s attention to detail: she is sensitive not only to the ways children engage with art, but also to how they feel physically while creating art. The aprons let children move freely without being hampered by stiff, bulky art smocks. Dawn’s watercolour illustrations are distinctive, with their use of fineliner and watercolour. Layers of watercolour in elegant tones capture doughnuts, cakes, food, plants, houses, and packaged goods. Dawn decided a while ago that drawing people was not for her, preferring to draw inanimate objects. Her style brings the subjects she paints to life, as if we are experiencing them through her eyes. “One word that’s kept coming up over the years is ‘raw’: how my work is so raw, almost like reading through someone’s journal. I like that,” she said. To find out more about Dawn and her work, visit her website or follow her on Instagram (@handmadelove). Jenni Mazaraki is an artist, designer, writer, and podcaster who helps women tell their stories. She is particularly interested in the ways women make time and space for creativity. You can see more of Jenni’s work at localstoryspace.com, on Instagram (@localstoryspace), or on Facebook. Anna Walker is one of Australia’s most established and beloved picture book creators. She has published twenty-fivebooks in a career spanning twenty years. Her newest book, Florette, has just landed in bookstores and is a beautiful meditation on how to become comfortable with change. 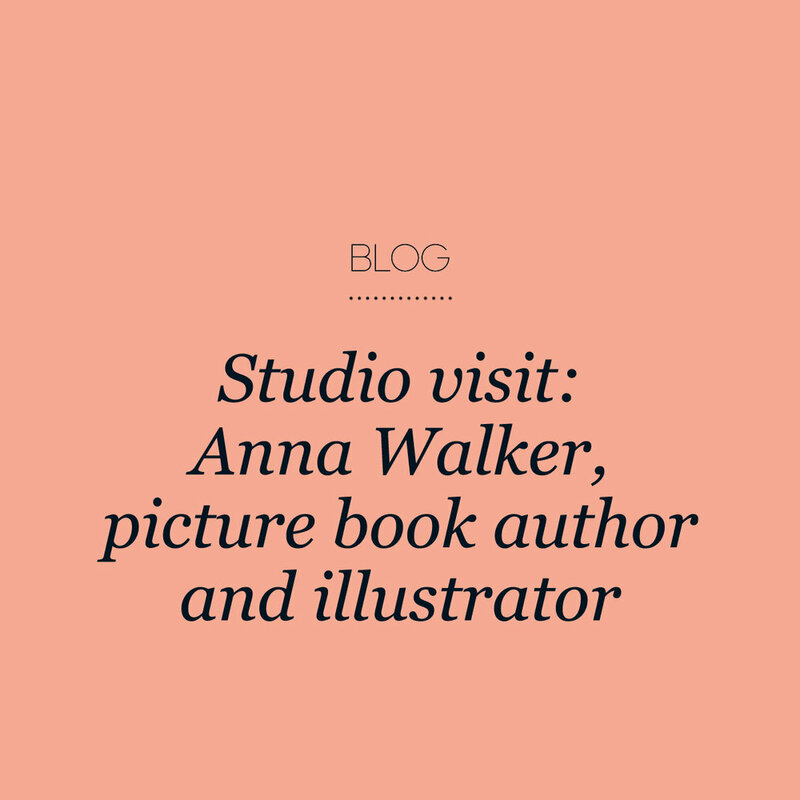 I met Anna in her studio, a converted shirt factory she shares with a printmaker, an interior designer, a tea importer, and a book designer. You know you’re talking to a visual thinker when she says, “I wish I could respond to your questions with a painting instead of with words.” But as you read on, I think you’ll agree that Anna’s words more than suffice! Anna had the good fortune of knowing what she wanted, right from the get go. “I remember looking at the illustrations in a book of fairy tales and thinking, ‘Those are so beautiful; that’s what I want to do when I grow up,’” she said. How did she turn that early inclination into a rewarding career? It was hard, she explains, and there were obstacles, but she would “try to find ways of overcoming them.” Anna is petite but possesses a stubborn determination, to which she largely credits her success. 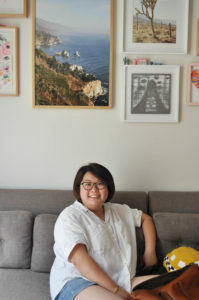 After studying graphic design at Swinburne University (where “there were no illustration courses,” she said), Anna set up shop straight out of school. Her parents ran their own business, so working for herself felt more like a natural step than a leap of faith. Besides, she says, “I had nothing to lose.” At first, it was all design work. Whenever there wasn’t enough work, she would invent briefs for herself and treat them as real commissions. After a few years, all of her work was illustration-based. Gradually, picture-book illustration became the foundation of her business. Anna and her character Mae in Florette have something in common. They like to be immersed in an environment that is beautiful and familiar. While Anna’s studio retains the exposed brick and pipework of its industrial heritage, she has transformed it into a bright, welcoming space. It feels like a loft, though it is actually a basement. Her desk looks out through an arched window at street level. She enjoys watching the passing foot traffic, including a Greek neighbor who always bends down to wave hello and children who look through her window. “I’ve always shared a studio,” she said. “I go a bit crazy working by myself at home.” Having others around provides moral support and an exchange of ideas, both vital to a happy work life. And from a business perspective, having to meet an overhead (rent) pushes you to find work. Just as important as environment is time. Anna devotes a year to each book, a pace that allows her to let the work develop fully, take on select commissions to subsidize her picture-book work, and be present for her three teenage children. Anna uses a variety of techniques in her work, including collage, woodblock printing, etching, watercolour, and ink. She’ll sometimes redo an illustration twelve times before she feels it’s right. Regardless of the method, her illustrations always seem to strike the perfect harmony between detail and simplicity. Certain things, like cold calling and quoting, never get easier. Anna doesn’t have to do the former as much these days, but her motto when something’s difficult is: do it anyway. She suggests viewing cold calling, networking, or whatever “thing” you find difficult as just one part of your business. If you’re not sure how much to charge for a job, Anna suggests talking to other illustrators. Take into consideration how the artwork is going to be used. Is it for one product, or multiple products? Will it be used locally, or globally? Also consider the duration of the usage license. Is it for one month? One year? In perpetuity? “I don’t part with copyright for anybody,” she said. There’s a way to give the client what they need and protect yourself. As she explains, “An exclusive license has just as much weight as copyright.” Don’t be afraid to request amendments to your contract. “I’m working on a book with Janie [Godwin, a long-time collaborator],” Anna explained, “and I’m also working on my own story about a walrus.” Anna often starts a project by crafting her character in toy form. She showed me a loosely stitched walrus plushy. “So far, that’s what I’ve got,” she laughed. 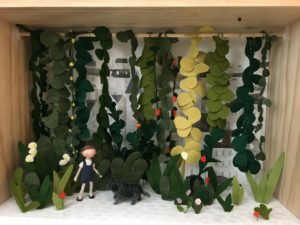 Recently, the final step on her projects has become creating a book trailer using stop-motion animation. For more about Anna Walker, visit annawalker.com.au. Jo Watson is a Melbourne-based screenwriter and artist. Visit her on Instagram (@diaryofapicturebookmaker).